Pat is a true healer. I did the reconnection healing with her and had a deep spiritual experience. I felt the presence of something greater and a true healing energy come over me. I saw and heard insightful information during the session. I felt a shift in my life after the process. I think this experience is different for everyone but for me it was very moving. I look forward to trying other healing modalities with Pat. Thank you for checking in with me after my Reconnection. Some interesting things have been happening. First, I am still feeling very peaceful and grounded. Second, I find it very easy to release negative thoughts and feelings now and I have been getting messages and lessons of faith (letting go and letting God have control of my life) and actually feeling faith and a general sense of well being much deeper than ever before. When I first came to Pat, it was for Reiki for my mom who had some neurological problems. At that meeting, Pat told me about The Reconnection and gave me Dr. Pearl's book. I have to admit that I was skeptical and I remained that way even as I booked my appointment for two-day Reconnection. I was generally open to alternative medicine and had even been a fellow at a center for alternative medicine, but I just could not get my head around how The Reconnection could work. In spite of my skepticism, and probably because I was in a really bad place, overweight, stressed, depressed and in pain from head to toe, I made the appointment. I had been through a nasty divorce and no matter what I tried, I couldn't seem to get closure. On top of that, in the past ten years, I had a lot of other tragedies, my mom's neurological illness, my sister's sudden passing and my dad's long death from cancer. I had been a passenger in two cars that were totaled in head on collisions and those injuries and old sports injuries were plaguing me daily. I hurt when I got up, I hurt when I went to sleep and I actually did not even realize how bad I felt until after The Reconnection. So, when I went to see Pat for my first session, I had the attitude that I might as well try it, but I did. As I lay there with my eyes closed, my body began to twitch and I couldn't stop it. A bright white light kept appearing before my eyes and there were periods when I thought I had blacked out, but I later remembered that these were periods when these sort of ethereal bodies were assessing what I needed to have healed. They focused on my legs, neck and arm and talked about my injuries from the accidents, sports injuries I had forgotten about, and what to do about the problems caused by my growth plates fusing too soon (something else I did not know about but made sense since I was predicted to be a lot taller than I was). After that first session, I was completely "wired" I remember telling a friend that I felt like I had drunk 20 cups of coffee. The morning before the second session, I felt compelled to do a 2-mile walk that I used to take with my former spouse. At the time I didn't know why, but now I think it was necessary to release that period of my life and the hurt and anger that had come from it. The second session was actually completely different from the first for me. It seemed like the first session was focused on the physical while the second was focused on the spiritual and emotional. During this session a very compact bright white light (imagine staring at a sun about the size of a moon floating in the night sky) communicated with me. This light was trying to get me to release my fears and I kept refusing. Finally, I agreed and while it is hard to explain, I felt as if the moment I released my fears, a wave of energy washed through me and for lack of a better term "cleansed" me. For the next three days, I was completely out of sorts. I told a friend that I felt like a guitar string must feel when it gets plucked. I could not calm down and I was completely filled with energy, I think I slept about eight hours total over those three days. My thoughts raced and while I was able to complete the task I was doing, I would think of several more things I would need to do and the minute I finished, I would start on the next. I have to admit, I got a lot of things done that I had been intending to do. The fourth day, I sort of "crashed" but mostly because all of the pains I had felt during all of my previous injuries surfaced. I felt like I did at the worst pain each of these injuries had caused. This lasted for about 18 hours, then it suddenly left and I felt better than I have felt in years. Next, scars that had long faded surfaced again and then disappeared again. Likewise, the emotional trauma from losing my sister and my dad and my divorce just evaporated. It was like I not only got to the "acceptance" stage that had eluded me for so long, I moved beyond that to where I simply saw those events as part of my life experience. About one week after my first session, I noticed that I had improved clarity. It was as if I was receiving guidance that I had not been open to before. I sort of knew what was going to happen before it did, not in a psychic sense, more like playing chess and figuring out what would happen five or six moves ahead. My productivity at work has improved dramatically, in fact, my first week back to work after The Reconnection, I accomplished more than I had in the entire month before. This clarity also extended into other areas of my life. I had wanted to change my life for a while and by that I mean I wanted to switch jobs or occupations, move to a different city and do different things. I had fantasized many times about moving and pursuing this "change" but I could not put this together into a definite plan. That is to say that it always felt more like a fantasy than anything I could actually achieve. Even though it has been just two weeks since my Reconnection experience, I now have a plan to move where I want to move and pursue the life I want to live and thus far, my "rational" self has been unable to come up with any argument why it can't work. I plan to update Pat when this all comes together along with any other healings I receive. Yesterday, I got the idea that I should ask my mom if she would like to do three healing sessions over the weekend. She said that would be a good idea. We did a little discussion first about what would happen and then I set her up and started. She had a lot of the registers (head turing, eyes fluttering, leg movements, breathing changes and stomach gurgling). I also had some registers, the palms of my hands got really hot and there was actually a breeze that came up in the room. I also had some guidance–for example, it was like someone was telling me, "work your way down to her right foot" and I would and then my palms would get super hot and her foot would start moving. I had some background music playing and the guidance said, "after this song you are done for today" and it was funny because even though I continued through the song, the registers stopped. This one went a lot better than the first time I tried (last weekend). I think it was because I got myself out of the way finally and just let it flow (the last time even though I tried I had this intention that she needed certain things healed). She really liked it and we are going to do another session today. I did the third session today and I got this idea to have my mom form an intent to be healed (I had not said anything like this to her before because it seemed like you are supposed to stay neutral–but today, I just really had this strong urge to tell her to form the intent to be healed). What followed was really amazing–there was a fairly steady breeze in the room (no open doors or windows and the ac wasn't running) and at about what ended up being the halfway point, I started moving my hands so fast it was like we they were hummingbirds and my mom was twitching and her legs were jerking and she sounded like she was sound asleep as far as breathing–but she wasn't. Then I sort of slowed down–but I was still doing the movements and she opened her eyes and said "ok, we're done." I haven't seen any big changes yet–but I imagine that some big healing is coming. The bedroom makeover also made my mom really happy and she started telling me that she really should not complain so much because she "has it good." That was about a week ago and since then, all of the talk of loss stopped. I think because of that, the whole energy in our household and between the two of us has shifted to a much higher and more positive place. I think she is continuing to get more and more benefits every day, so I am certain the next update will have even more good news. Interested in Experiencing Reconnective Healing or the Reconnection? 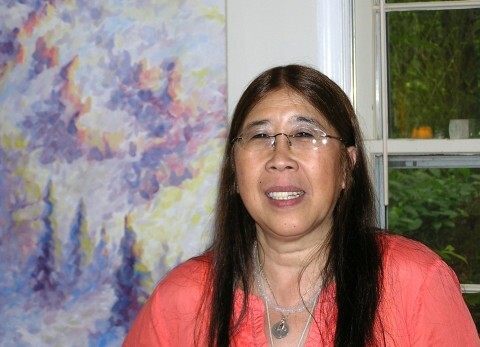 Please contact Karuna Joy (formerly Pat Chen), a teacher and experienced facilitator of spiritual energy healing sessions, thoroughly trained in Reconnective Healing and the Reconnection, and passionate about it. Karuna Joy has clients from Northern Virginia, including the Herndon, Reston, Sterling, Ashburn, Round HIll, Great Falls, Vienna and Oakton area, as well as all over Greater Washington DC, including Tyson’s Corner, McLean, Alexandria, Bethesda, Rockville, Columbia, and Silver Spring, Maryland. Her work is also accessible to all parts of the US and the world via phone and long distance healing. Reconnective Healing is highly effective as Distance Healing. Karuna Joy, originally from Queens, New York, attended college at the University of Michigan, Eastern Michigan University, and Glendale University, earning a degree in Natural Health. She has been a play therapist and teacher of young children, homeschooling mother of five, folk musician, and spiritual healer and teacher. Her current absorption in and dedication to Reconnective Healing and facilitating the Reconnection is a natural unfolding of her lifelong passionate journey towards, light, love, peace, and wholeness. Reading Eric Pearl’s Reconnection catapaulted her into a completely different, but delightful dimension, where infinite doors of possibility opened everywhere. Nothing was the same, ever again. Karuna has witnessed immediate and significant healings with Reconnective Frequencies – from severe anxiety, depression, and apparent neurological disorder, to extreme physical pain, skin disorders, and cancer. She sees over and over again how Reconnective Healing is a very powerful high frequency energy that works deeply, seemingly more deeply than anything ever before, to facilitate balance and healing of body, emotion, and spirit. Experiencing the Reconnection is no less than a “miracle” for many of her clients. Past life experiences, meeting guides and angels, spirit journeying, spectacular colors and tones, feelings of infinite peace, and massive physical clearings, are among some of the phenomenal experiences of her Reconnection clients. Significant life changes occur as the process continues to unfold in the subsequent time period following the process, for up to 9 months. Karuna is forever grateful for this precious opportunity of having learned Reconnective Healing and the Reconnection facilitation, and for the joy of being able to share these powerful healing frequencies with others. She is deeply honored and thankful that so many have come to her, and continue to do so, to receive these significant healing experiences. Each time Karuna facilitates a Reconnective Healing or Reconnection, she, too, feels herself coming into balance, peace, and wholeness, marvels at this and gives thanks.